WordPress is the most popular CMS (content management system) on the internet. It allows you to easily set up flexible blogs and websites on top of a MariaDB backend with PHP processing. 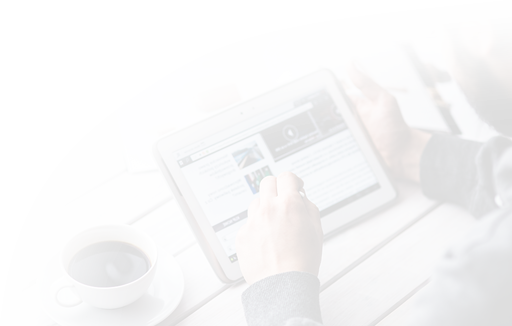 WordPress has seen incredible adoption and is a great choice for getting a website up and running quickly. After setup, almost all administration can be done through the web frontend. In this guide, we’ll focus on getting a WordPress instance set up on a LAMP stack (Linux, Apache, MariaDB, and PHP) on a Debian 9 server. Install a LAMP stack: WordPress will need a web server, a database, and PHP in order to correctly function. Setting up a LAMP stack (Linux, Apache, MariaDB, and PHP) fulfills all of these requirements. Follow this guide to install and configure this software. If you have a domain name… the easiest way to secure your site is with Let’s Encrypt, which provides free, trusted certificates. Follow our Let’s Encrypt guide for Apache to set this up. If you do not have a domain… and you are just using this configuration for testing or personal use, you can use a self-signed certificate instead. This provides the same type of encryption, but without the domain validation. Follow our self-signed SSL guide for Apache to get set up. When you are finished with the setup steps, log in to your server as your sudo user and continue below. The first step that we will take is a preparatory one. WordPress uses MySQL to manage and store site and user information. We have MariaDB — a drop-in replacement for MySQL — installed already, but we need to make a database and a user for WordPress to use. After issuing this command, MariaDB will prompt you for the password you set for that account. Begin by creating a new database that WordPress will control. You can call this whatever you would like but, to keep it simple for this guide, we will name it wordpress. Note that every MySQL statement must end in a semi-colon (;). Check to make sure this is present if you are running into any issues. Next, create a separate MySQL user account that we will use exclusively to operate on our new database. Creating single-function databases and accounts is a good idea from a management and security standpoint. We will use the name wordpressuser in this guide, but feel free to change this if you'd like. Now that you’ve configured the database and user that will be used by WordPress, you can move on to installing some PHP-related packages used by the CMS. When setting up our LAMP stack, we only required a very minimal set of extensions in order to get PHP to communicate with MariaDB. WordPress and many of its plugins leverage additional PHP extensions. Note: Each WordPress plugin has its own set of requirements. Some may require additional PHP packages to be installed. Check your plugin documentation to find its PHP requirements. If they are available, they can be installed with apt as demonstrated above. At this point, all that’s left to do before installing WordPress is to make some changes to your Apache configuration in order to allow the CMS to function smoothly. With the additional PHP extensions installed and ready for use, the next thing to do is to make a few changes to your Apache configuration. Based on the prerequisite tutorials, you should have a configuration file for your site in the /etc/apache2/sites-available/ directory. We'll use /etc/apache2/sites-available/wordpress.conf as an example here, but you should substitute the path to your configuration file where appropriate. 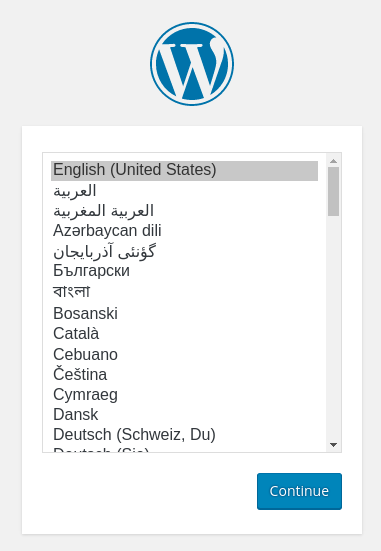 Additionally, we will use /var/www/wordpress as the root directory of our WordPress install. You should use the web root specified in your own configuration. Note: It's possible you are using the 000-default.conf default configuration (with /var/www/html as your web root). This is fine to use if you're only going to host one website on this server. If not, it's best to split the necessary configuration into logical chunks, one file per site. Currently, the use of .htaccess files is disabled. WordPress and many WordPress plugins use these files extensively for in-directory tweaks to the web server's behavior. 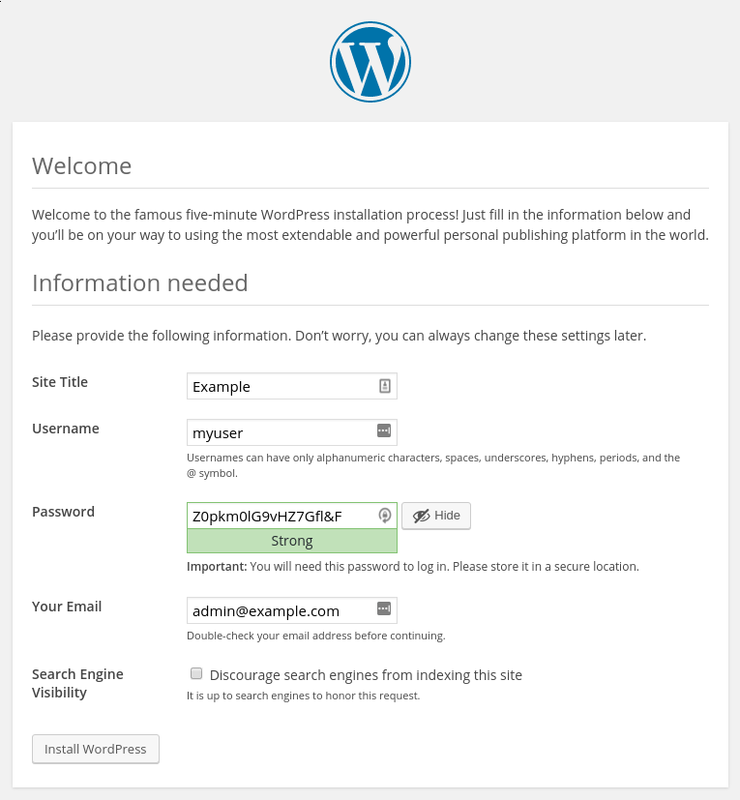 Now that your server software is configured, you can download and set up WordPress. For security reasons in particular, it is always recommended to get the latest version of WordPress directly from their site. We will move these files into our document root momentarily. Before we do, though, add a dummy .htaccess file so that this will be available for WordPress to use later. With that, you’ve successfully installed WordPress onto your web server and performed some of the initial configuration steps. Next, we’ll discuss some further configuration changes that will give WordPress the privileges it needs to function as well as access to the MariaDB database and user account you created previously. Before we can go through the web-based setup process for WordPress, we need to adjust some items in our WordPress directory. Start by giving ownership of all the files to the www-data user and group. This is the user that the Apache web server runs as, and Apache will need to be able to read and write WordPress files in order to serve the website and perform automatic updates. These should be a reasonable permissions set to start with, although some plugins and procedures might require additional tweaks. Following this, you will need to make some changes to the main WordPress configuration file. When you open the file, your first objective will be to adjust some secret keys to provide some security for your installation. WordPress provides a secure generator for these values so that you do not have to try to come up with good values on your own. These are only used internally, so it won't hurt usability to have complex, secure values here. Next, modify the database connection settings at the top of the file. You need to adjust the database name, the database user, and the associated password that you’ve configured within MariaDB. The other change you must make is to set the method that WordPress should use to write to the filesystem. Since we've given the web server permission to write where it needs to, we can explicitly set the filesystem method to "direct". Failure to set this with our current settings would result in WordPress prompting for FTP credentials when you perform certain actions. Save and close the file when you are finished. Finally, you can finish installing and configuring WordPress by accessing it through your web browser. Next, you will come to the main setup page. Select a name for your WordPress site and choose a username (it is recommended not to choose something like "admin" for security purposes). A strong password is generated automatically. Save this password or select an alternative strong password. From the dashboard, you can begin making changes to your site’s theme and publishing content. 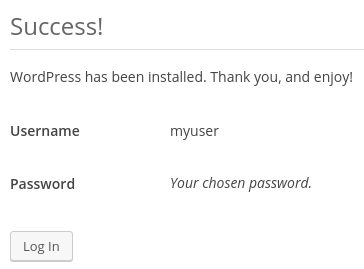 WordPress should be installed and ready to use! Some common next steps are to choose the permalinks setting for your posts (which can be found in Settings > Permalinks) or to select a new theme (in Appearance > Themes). 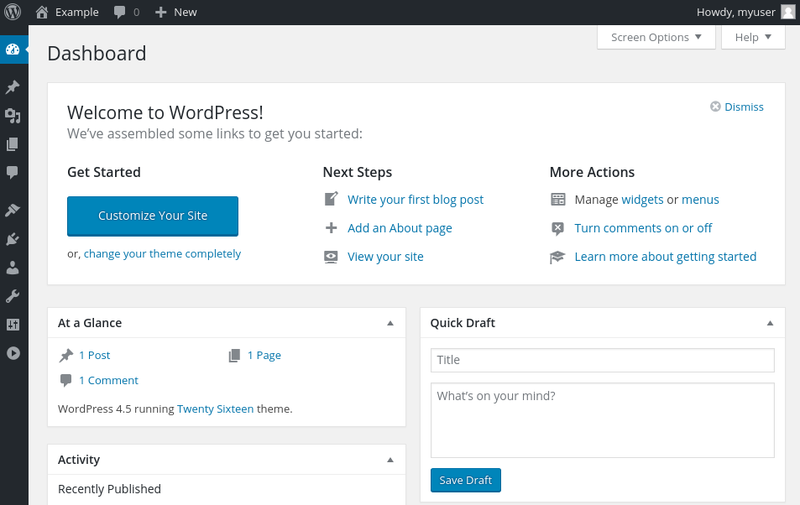 If this is your first time using WordPress, explore the interface a bit to get acquainted with your new CMS.